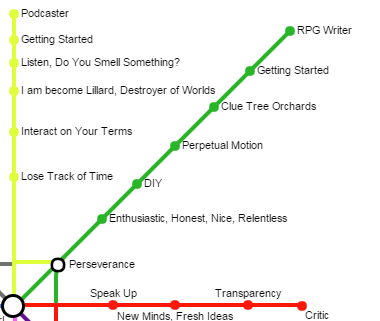 Perpetual motion is real and it’s a thing that powers the RPG industry. That and steam. And dice. What else did you think D12s were for? Perpetual motion in this instance means keeping moving. Always be working on something, always be looking for something else. There’s a tendency for the inherent lack of self-confidence a lot of writers have to kick in and leave you hunched over your project, shovelling it into your face as fast as you can, growling at passers by and absolutely convinced that it’s all you’ll get. It’s not. Finish it on time, and word count and if you can’t, let your editor know at least a week ahead of time. This is the only part of the writing industry I’ve worked in where word counts are a touch spongey. Some times that will torment you. Sometimes it will save your life. I promise the second will happen way more. But keep writing, keep talking and when a project is handed in, ask what else you could be put on. It won’t work all the time; at the top of this year I was looking at four projects to get to the end of the year. Right now, I’m looking at two with a third as a possible last minute guest star. But here’s the thing; if you find you’re a little reluctant, ask yourself this. What am I going to get if I ask for nothing? And that’s an answer you already know. Be polite, be enthusiastic, be professional and be visible. It’ll pay off.